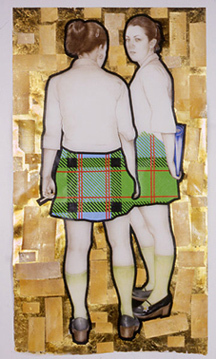 Jennifer Linton, Catholic Girls, 2004. 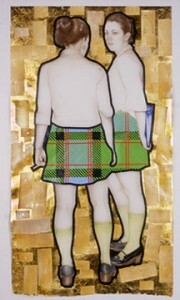 Coloured pencil, ink, tape, composition leaf and cigarette foil on Mylar. Courtesy of the artist. Subject(ive) Aesthetics explores the work of five artists whose practices are marked by a desire to communicate social concerns through the incorporation of influences derived from their individual life experiences. These artists recognize that they are the products of their own histories and have harnessed this fact through the development of unique aesthetic vocabularies that offer multiple points of entry to prospective audiences. Through their personalized adaptation of ethnographic styles and imagery, and their infusion of autobiographical narrative, these artists create works that present them as individuals seeking to share personal concerns, provoke critical thinking, and encourage discussion. Featured Artists: miriam bohemia (Vancouver), Farheen HaQ (Toronto/Victoria), Elly Lee (Toronto/Seoul), Jennifer Linton (Toronto), and Fariba Samsami (Montreal).